THROUGH the alchemical process of etching, Richard Rowland explores the dramatic tone and texture of landscape in his Recent Prints exhibition currently on view at Vaila Fine Art Gallery in Lerwick, writes Alex Purbrick. During his professional career as a lawyer he studied various art evening classes at the Camden Institute in London, one of which was etching and lithography and over the years has experimented with a variety of etching techniques as well as studying the methods employed by one of the great masters of etching; Rembrandt. Working from his studio in his house near Burrastow, overlooking the island of Vaila, Richard bases his etching prints from small digital photographs he has taken of various scenes of landscapes he has visited. 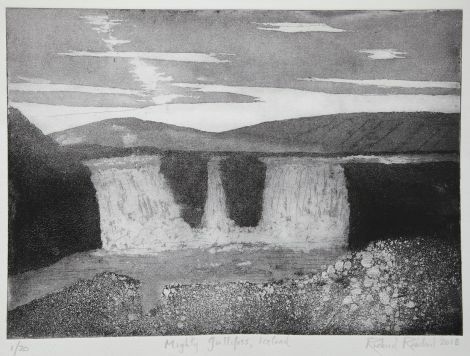 His most recent travels led him to Iceland and Faroe where he translated the sparse, vivid panorama into a series of foreboding black and white etchings, one of which, Mighty Gullifoss, highlights the extremes of tone and texture displayed in one of Iceland’s spectacular waterfalls. The beauty in the process of etching is the luminosity it can produce which Richard demonstrates through his pictures, most especially the Eclipse at Lera Voe, inspired by the intensity of light in Shetland and a vision of the landscape influenced by the ever-changing colours of light play. Prints like Northern lights over Walls and Da Tree Isles show Richard’s exploration into the use of colour. Colour also features in a few etchings and lino prints exhibited based on the artist Cezanne’s paintings of Montagne Sainte Victoire in Provence. Whereas Cezanne used colour to intensify the landscape, Richard uses tone, employing different tones of black ink to reproduce Cezanne’s colourful cubist patches of nature in a selection of colour and black and white lino prints. Richard’s years of experimentation and development of etching techniques are certainly on display in this exhibition as the delicate lines and subtle use of tone and form to explore light in the landscape comes to the fore creating a series of prints that illustrate the intimate connection between artist and landscape. Recent Prints is currently exhibited at Vaila Fine Art in Lerwick. The exhibition runs until mid September and is open on Tuesdays, Thursdays and Saturdays between 11am and 5pm.